Hello!I hope you had a fabulous weekend! I had a true pleasure to speak at the Spark Sessions Photography Workshop on Saturday. It was so great meeting the Spark Sessions team and also the group of up and coming bloggers. Casey Palmer also did a fantastic job on sharing his photography skills. What a great way to spend a Saturday afternoon. I’m sorry I missed posting this Spring Beauty segment last week, primarily because my cold set my schedule back several days but here it is! A couple of weeks back, I talked all about hair products for Spring. I shared some of my newest favourites. Today, I want to talk about skincare products. I’m not even going to lie, I am super low maintenance (some would also call in lazy) when it comes to facial skincare. When I was a teenager, my skin was very sensitive and reacted negatively to almost any specialty skincare products and so I defaulted to using the one thing that worked for me – body lotion on my face. I know some of you are cringing! As I aged, I found that my facial skin became less sensitive and I’ve actually been able to try several products over the years but still, I never stuck to a regime. One thing I wanted to do stepping into my 30’s was to stick to a healthy skincare regime. 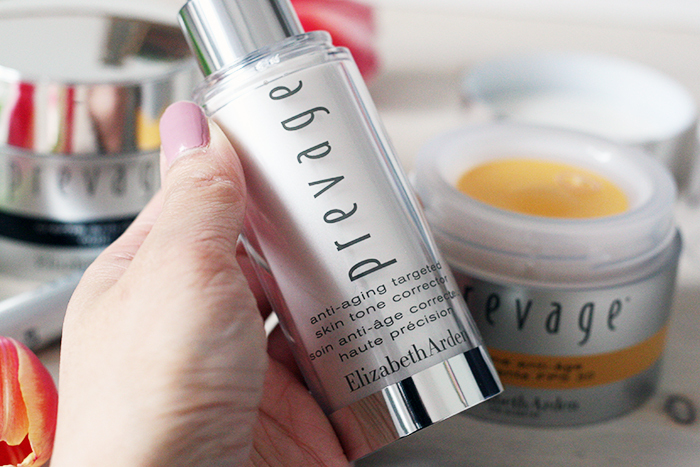 I was introduced to Elizabeth Arden’s Prevage line of skincare products. I’ve been using the day cream (SPF 30) and night cream in the last month coupled with their skin tone corrector. 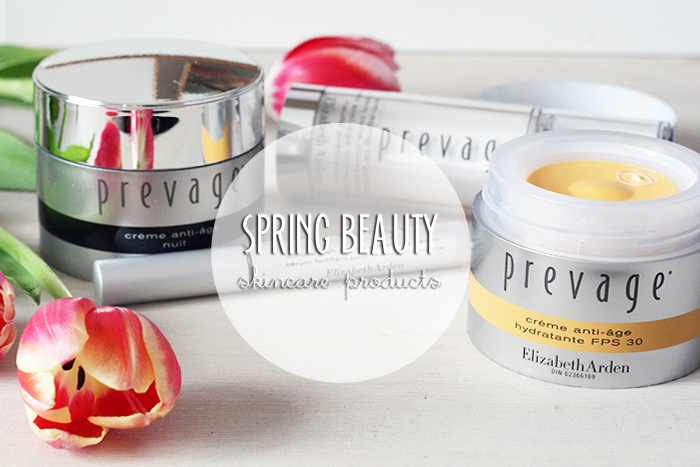 The Prevage line focuses on anti-aging and protection. I really like the texture of the day/night creams. They both provide good coverage in terms of eliminating dryness without a ‘cake-iness’ feeling. I’ve been using both creams for about 2 weeks now. I’ve also been applying the Targeted Skin Tone Corrector to dark spots which is supposed to yield results as early as 14 days. I’ll have to share my results in another few weeks with you as I haven’t been religious with my application. One really cool product that I’ve been hoping to try for a number of years now is an eyelash growth product. I’ve not been blessed with thick and long lashes and meanwhile I’ve mastered putting on falsies, but let’s face it, sometimes morning schedules just don’t allow for it! 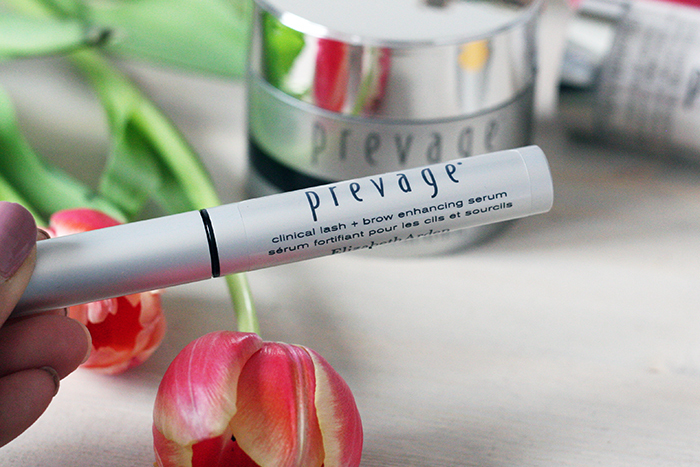 I started to try Prevage’s Clinical Lash + Brow Enhancing Serum. It’s a simple process – apply a thin layer onto the top of eye lids before bed. This product is also suitable for brows. I’ve been using this product for just under 2 weeks now. I haven’t seen dramatic results just yet, however have found that new hair growth around my last line is certainly visible. One thing to note is that I have not experienced any no adverse reactions, i.e. dark circles, itchiness, etc. which some other products on the market have rumored to cause. 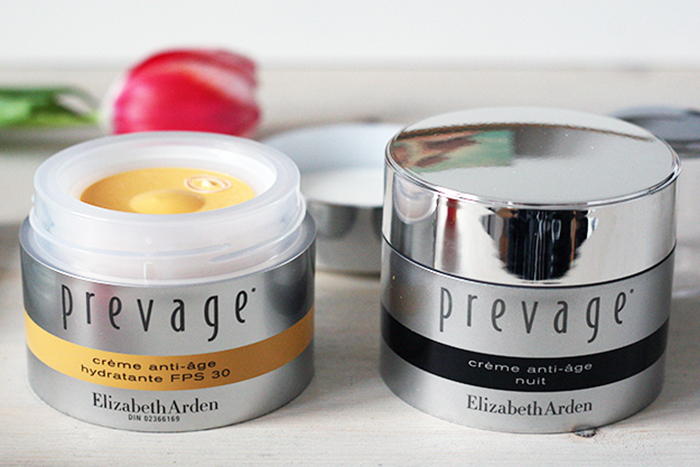 Overall, if you’re looking for a anti-aging skincare regime, I recommend trying Elizabeth Arden. With the warmer weather comes more sun, which means tanning … and more importantly sun protection. If you’re really allergic to the sun or freckle easily, CLARINS has come up with an extremely innovative self-tan product for your face that allows you to achieve that golden ton without having to tan in direct sunlight. Unless traditional self-tanners, the CLARINS Golden Glow Booster is a solution to be combined with your current facial lotion/cream. A couple of droplets mixed with your current lotion/cream will provide you with an instant golden glow. I had the chance to try this product first hand and it’s fabulous. Perfect for those of you who are not big fans of tanning or applying traditional self tanners. This product is made for the face, though you can apply to other parts of your body, but as you can see, the bottle is quite small ($30), so you’re not going to get your money’s worth smearing it across your arms and legs! Now, if you’re like me and enjoy a good sun bathing session on the beach, applying sunblock is extremely important, especially as you age. 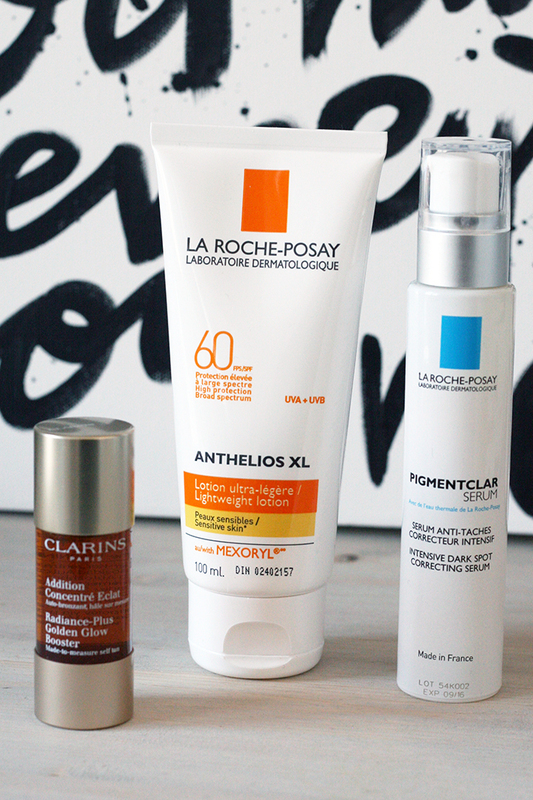 I recommend using a great BB cream with a strong SPF (I really like Dr. Jart) or if you’re keen on going au natural, try La Roche-Posay Light-Weight Anthelios SPF 60. This sun block is extremely light weight and provides a strong, waterproof (80 mins), matte finish sun block coverage. I talked above about Prevage’s corrector serum, another great alternative is La Roche Posay’s Pigmentclar Serum (newly launched). This product give visible signs of result after 2 weeks of use, but it is meant to be used daily over time to yield the best results. I’ve asked my mom to try this product for me as she has quite a few dark pigmented spots on her face, so I’ll be reporting back very soon! 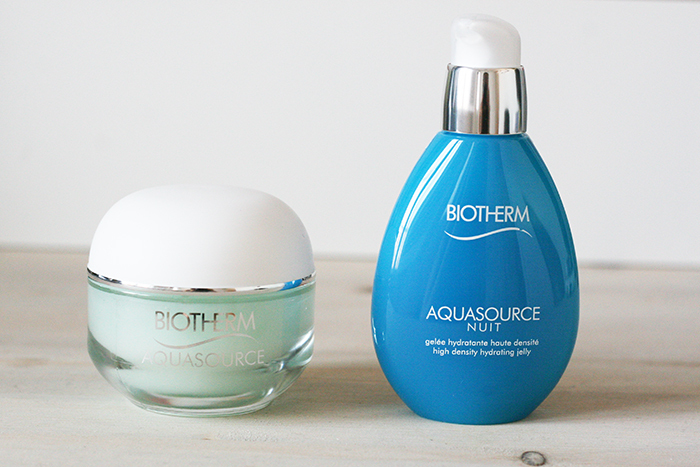 Now, if you’ve got dry skin and looking for a hydrating option, Biotherm’s Aquasource line could be a good option for you. The Deep Hydration Replenishing Gel acts as a hydration protective layer for your face, applied as a gel and finishing off with a cream/lotion. Equally, you can also consider coupling with Aquasource Nuit. 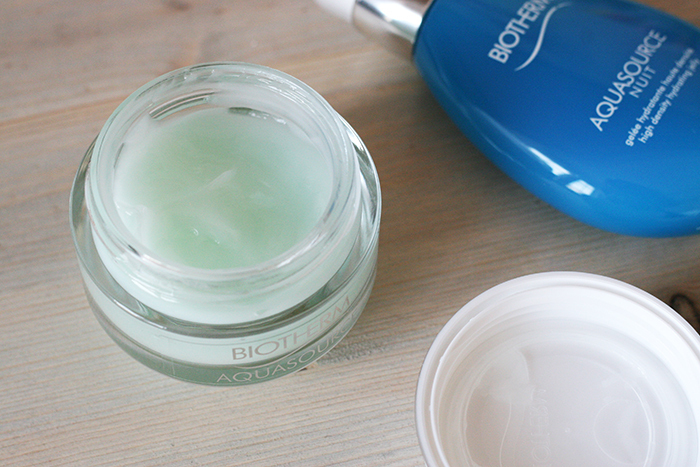 A hydrating jelly made specifically for locking in moisture over night. At night, your skin loose 4 times the moisture as the day, this night product will help retain moisture overnight. I see both of these options as a great sunscape travelling companion, where in really dry, hot climates, hydration is an extra priority. Last but not least, can’t forget about our hands and feet! My hands generally suffer from a cold, dry, harsh Winter. If I leave them unattended, the skin cracks and any pretty manicure won’t really help the job. That’s why I always keep a tube of hand cream in my purse. I HAVE to put on hand cream after every hand wash… it’s a bit OCD I would say. I’ve come to LOVE The Body Shop’s HEMP collection. 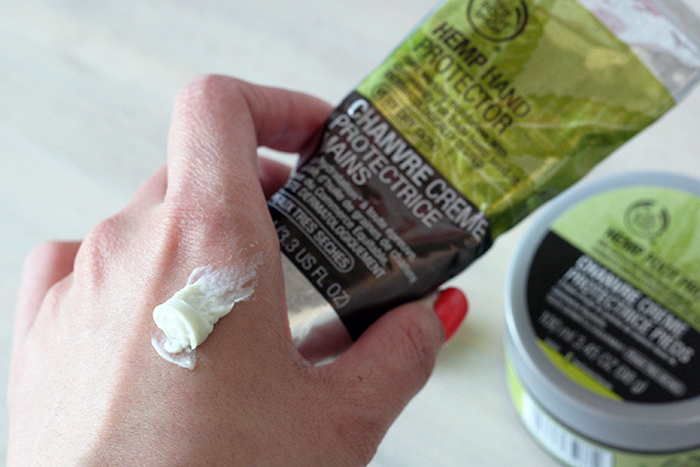 As you can see from the photo, the texture of the Hand Protector (a best seller!) is not quite that creamy, yet its got some density to it to provide fantastic coverage for dry, cracking skin. I also like the fact that it’s not overly fragrant, it has a nature “plant” smell to it. 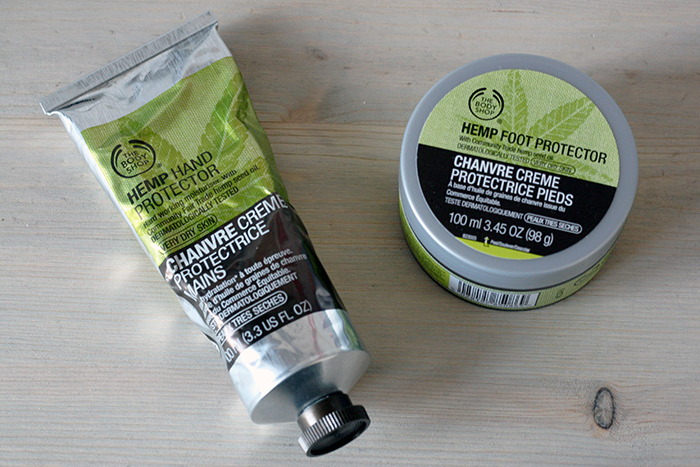 It’s actually quite refreshing and saves you from walking into a room smelling like a giant peach 🙂 My feelings are the same towards the HEMP Foot Protector, especially for the summer as sporting sandals tends to result in dry heels. The Body Shop also carries several other products under the Hemp Collection and is now offering a Buy 2 Get 1 Free or Buy 1 Get 1 50% Off sale. I’d love to hear about your favourite skin care products. Have you tried some of the products I mentioned above, what was your experience? I’m headed off to Paris tomorrow night and having a hard time containing my excitement! I’d appreciate any suggestions as this is my first visit. Please comment below! Hiya! Quick question that’s ttally offf topic.